Yet another brand has revealed its contribution to Only Watch 2011. Urwerk just announced on its Facebook page, a unique white gold Urwerk UR-103 will go under the hammer in September at the Only Watch auction. 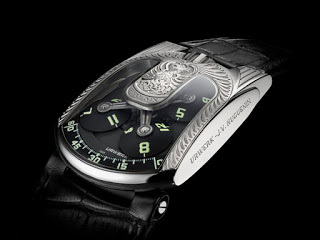 The Urwerk UR-103 Phoenix is hand engraved by Jean-Vincent Huguenin with a phoenix rising from the ashes.